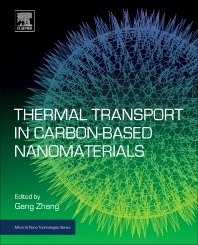 Thermal Transport in Carbon-Based Nanomaterials describes the thermal properties of various carbon nanomaterials and then examines their applications in thermal management and renewable energy. Carbon nanomaterials include: one-dimensional (1D) structures, like nanotubes; two-dimensional (2D) crystal lattice with only one-atom-thick planar sheets, like graphenes; composites based on carbon nanotube or graphene, and diamond nanowires and thin films. In the past two decades, rapid developments in the synthesis and processing of carbon-based nanomaterials have created a great desire among scientists to gain a greater understanding of thermal transport in these materials. Thermal properties in nanomaterials differ significantly from those in bulk materials because the characteristic length scales associated with the heat carriers, phonons, are comparable to the characteristic length. Carbon nanomaterials with high thermal conductivity can be applied in heat dissipation. This looks set to make a significant impact on human life and, with numerous commercial developments emerging, will become a major academic topic over the coming years. This authoritative and comprehensive book will be of great use to both the existing scientific community in this field, as well as for those who wish to enter it. Gang Zhangb is Senior Scientist and Capability Group Leader, Institute of High Performance Computing, A*STAR, Singapore. He was previously Full Professor, Department of Electronics, Peking University, China, and has also been Visiting Professor at the Department of Mechanical Engineering, University of California, San Diego, USA. The author of over 100 peer-reviewed journal articles and editor 2 books, Prof. Zhang has served on the Editorial Board of 3 journals.